Surely your web team has done their best to make your website easy to understand and navigate. Even so, there will always be people who wish they could have someone give them a guided tour of the site, or walk them through the specific steps they need to take. Having staff available to do this 24/7 is clearly impractical. But what if your website could do the job itself? What if your website could give users interactive walkthroughs and experiences without requiring a live person to do the job? This is what Toonimo offers. This SaaS (Software-as-a-Service) product can overlay multimedia content on your website. This layer can interact with your website and its visitors in real time, using your website's real content. At the same time, it can respond to user actions and changes on the site, delivering information with human voice and/or text bubbles, as well as graphics. And it can do so for virtually any hardware platform (PC, tablet, smartphone) and all the most popular web browsers. Note the Toonimo audio bar at the bottom of this page. In this review, we will take a look at what Toonimo can do and give you an idea of what it would take to deploy it on your website. Deploying Toonimo on your site involves adding triggers to your web pages and creating scripts (engagements) that are activated by those triggers. These scripts can do things like point at a button with an animated arrow, pop up a text bubble with more information, or play back a human voice with a relevant message. But if you are visualizing something like a pre-recorded video walkthrough, you are missing what makes Toonimo different. First off, Toonimo is interacting with your actual website, rather than playing back a video. You aren't going to be showing your users a video of some process recorded on some typical piece of hardware. They will see everything as it appears on their own device. But even more importantly, Toonimo is interactive. It responds to user input. We've all experienced walkthroughs that consist of a video of someone completing a process. They may be enhanced with voice-overs, highlighting, added notes and so on. But they lack interactivity. Toonimo can give you the same kinds of special effects on your website, but in an interactive format. 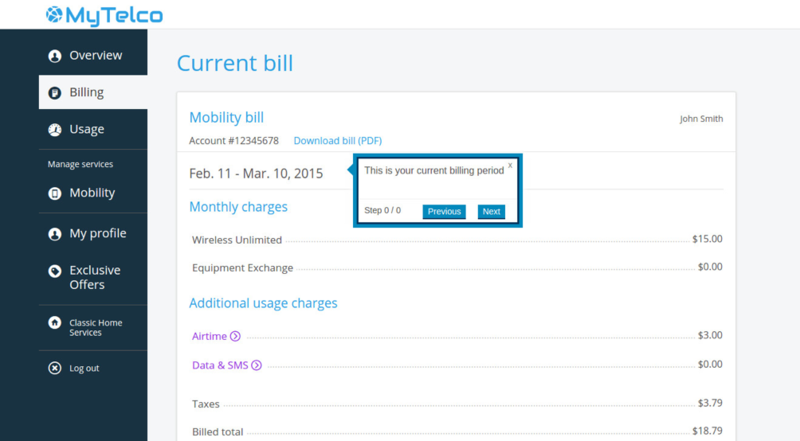 Toonimo can read and respond to the information that appears on the screen ("Joe, your balance due is $123.54.") as well as respond to user input ("You have just upgraded to the MegaData plan, Mrs. Smith"). Capabilities like these humanize and personalize each user's interactions with your website. Toonimo offers a range of features that make it easier to create the experiences and walkthroughs users can find on your website. The Editor is a WYSIWYG tool that makes it easy for you to create the engagements visitors can experience. It is designed to be simple enough for a non-technical person to use. You can use it to add launchers (buttons and other controls) to your pages to trigger engagements and full walkthroughs. Toonimo include GEO Location that lets it interact with the visitor using any written or spoken language. Audio-Visual. Uses human voice and constructed sentences (sentences that vary depending on data from the page instead of a set sentence each time) to guide users. Any set of languages and dialects can be used in the recording of audio-visual walkthroughs. Text Bubbles. Text bubble walkthroughs look a little like the comic strips you see in your Sunday paper, with the dialog appearing in little bubbles next to the speaker's head. This type of walkthrough is similar, with bubbles appearing next to the relevant objects on the screen. Toonimo supports any written language in these bubbles so you can create walkthroughs for your audience wherever they are in the world. While Audio-Video and Text Bubbles are the two basic styles of walkthrough, sometimes a blended approach is better. Toonimo handles this as well, giving you the maximum flexibility to create your experiences and walkthroughs. The Rules Engine handles complex custom rules so your site can respond intelligently. This can include walkthroughs that cover multiple pages on your website, giving you great flexibility and optimizing the customer experience. For situations like onboarding or user training, you can implement a Search function so users can choose which experiences and walkthroughs they want to use. Another powerful feature of Toonimo is that it works cross-platform and cross-browser. That is, the experiences and walkthroughs you create will work on Desktops, Tablets, and Smartphones. It also works with the most popular browsers. This means the vast majority of your visitors will be able to benefit from Toonimo, regardless of the hardware or browser they are using. To make sure your experience with Toonimo is a win, you are assigned a Success Manager as your first point of contact. The Success Manager ensures that your implementation goes smoothly and acts as your interface with the Toonimo technical staff. If you don't want to implement Toonimo yourself, they have a Professional Services team that can do the work for you. As with anything else you do on your website, reporting results and testing new approaches is important for Toonimo. To help with this, the service includes a dashboard with analytics, as well as built-in A/B testing. The reporting side of this includes aggregated analytics for each walkthrough, with platform-specific information. You also get "goal based analytics," statistics like conversion and bounce rates, time on page, walkthrough completion rate, and so on. These allow you to see how well you are achieving your performance goals. You can also see the results of your A/B (split) testing here. Toonimo's A/B testing capabilities are flexible. You can change any element in a walkthrough and create a test based on that change. Script elements, buttons, style, all are things you can test against to find the best results. As mentioned above, you'll be able to see the results of each test on the goal based analytics page in the dashboard. Customer Service & Support. Engage your customers and provide them with humanized support through digital walkthroughs. With the ability to do things like walk your customers through their monthly statements and serve up answers to common questions before they are asked, your site can provide a better user experience with lower support costs. Marketing. Boost engagement with personalized walkthroughs based on user behavior and other parameters. Increase conversions with helpful annotations and the warmth of a human voice. Onboarding & Training. Guide users through the onboarding experience with friendly spoken instructions and feedback. Improve the training experience and promote self-service and self-training with personalized walkthroughs. Accessibility. Add voice and visual interactions to your site to make it more accessible to those with disabilities while increasing the share of the total market you can reach. Now this all sounds great in the abstract. Still, it would sure be nice to see how Toonimo is used in your industry and what kind of results other companies have gained from using this service. That's where the Industries guide comes into play. This section covers 10 industry segments, from ecommerce businesses to utility providers. The information you will find for each of these segments varies. There may be quotes from customers on why they choose Toonimo, or statistics on successes customers have had using the solution. And there is also a bit of information about why Toonimo is a good solution for that industry segment. I wish there was more meat to this section, but if you are in one of the industries profiled, it is certainly work taking a look. A walkthrough with Text Bubbles. Each of the demos presents an example of how you might use Toonimo, and showcases the benefits of the product for that use case. The demos are short, yet really helpful in understanding the Toonimo service. Highly recommended. Toonimo doesn't offer set pricing. Instead, they will work out a price with you depending on what you need the service to do. As we've seen, Toonimo is a service that gives you a more interactive, more humanized way to guide visitors to your site. If visitors need a lot of personal support when using your website, this could lead to major savings for you. Even if your visitors don't ask for a lot of support, browsing the Industries section of the Toonimo site shows that implementing these walkthroughs can result in significant increases in user engagement. While there are some clear benefits to using this service, you have to balance that against the work involved to add Toonimo to your site and the potential benefits it brings. How much more effective would your website be with humanized, interactive walkthroughs like this? Getting a demo is the next step in finding out. Click here to Request A Demo today. Read more about Toonimo on DiscoverCloud.